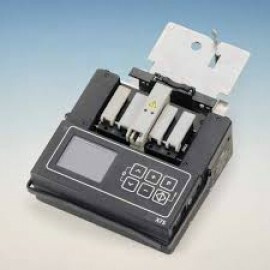 Corning Cable Systems X75 Micro Fusion Splicer combines small size with big-machine capabilities. Completely automatic, the X75 unit cleans, gaps, and fuses fibers at the touch of a button, achieving an average splice loss of 0.05 dB on identical single-mode fibers. While this performance is remarkable, the X75 also instantly estimates splice loss. Under laboratory conditions, fixed V-groove splicers are routinely able to achieve excellent results with most contemporary fibers. In the field, however, dust, environmental conditions, and simple human error can all degrade true splice loss performance. Using its two built-in video cameras, the X75 estimates the loss of every splice made and displays the results on its high-resolution LCD screen. Since the quality of the splice is analyzed on-site, the danger of numerous remakes is minimized. Splice protection options include an attachable heat-shrink oven and Corning Cable Systems Crimp & Go splice protection crimping device. A universal splice tray holder is also available. With the addition of the Fitel S-311B the X75 becomes a complete system that provides quick, reliable splicing at the touch of a button. The splicer and all of its options fit perfectly into the sturdy transit case. Advanced features and simple, one-button operation make the X75 the ideal choice for both novice and expert splicers.